Sebastian Vettel (2nd): "Overall I'm happy and pleased with the result, we know that it's very difficult to overtake here. Congratulations to Nico, he did a very good job and had a very controlled race; I think he had the pace and the tyres to respond whenever we tried to get a little bit closer to him. I had a fantastic start, but there was no room! I think I could have gone past both Mercedes, but there was no space and I had to lift. Then Mark came and it was very tight into the first corner. I was a bit surprised by the slow pace of the opening laps “ usually you expect two silver arrows in front of you, but they were more like buses today going for a cruise on the first couple of laps. But, the strategy for them was clear and they did a very good job. It was a good strategy from our team to get past Lewis. It was hard with the restarts, but we can be happy with the result. It was a good achievement by the team; we seem to like this place. Congratulations to everyone and thanks to all our partners “ two cars on the podium is very good." Mark Webber (3rd): "First of all congratulations to Nico, it's a very special place to win here and he had a seamless weekend; that's what you need to do here. Even though he started in the lead, you still have to pull it off so well done to him. For us, we knew we were a little bit against it starting on the second row, but I got an absolutely incredible start and it's sod's law that it's the shortest run into the first corner here. Seb and I had nowhere to go, so we were lifting while Nico and Lewis looked like they had tricky ones. We will save some of those starts for future reference! Then after that it was basically about saving the tyres and making the one-stop work for us. It was predictable that if the race was going to stack up, then the two-stop was not really an option as you could have come back into traffic. We had to go pretty long and all the drivers were nursing the tyres “ it was nice to get Lewis on the stops." Christian Horner, Sporting Director: "Second and third with the least amount of time for both our cars in the pit lane today is a very positive team result. We managed to get both cars ahead during the pit stops and safety car period, in what turned out to be a relatively processional race due to everyone adopting a one-stop strategy. At Monaco you can never overtake, so it was all about conserving tyres and managing the pace until the end of the race. As we saw with Sebastian, the pace was there as he set the fastest lap, but today I think second and third was probably optimum from our grid positions." Thierry Salvi, Renault: "While we would have liked to get the win today, everyone is aware overtaking is difficult at Monte Carlo. The safety cars didn't provide much opportunity for creative strategy, so we can be happy with a double podium. It's the fourth consecutive year the Red Bull-Renault partnership has finished on the podium, so it is great to keep that record going." Fernando Alonso (7th): "Unfortunately today we didn't manage to have a good pace, as is usually the case on Sunday and I wasn't pessimistic about not being competitive yesterday, because so far, things have always improved in the race. That wasn't the case today, maybe down to a lack of traction, a problem we had seen before in Bahrain. This race came at the end of a weekend that overall was difficult, starting with a qualifying that left me in the middle of a group of drivers who had nothing to lose. If I had not cut the chicane, I would not have been able to avoid colliding with Perez and the same thing happened at Loews with Sutil. As for what Sergio did, I don't have much to say, his approach reminds me of my own in 2008 and 2009, because when you are not fighting for the Championship, you can take more risks, while for me today, it was important to finish the race and bring home as many points as possible. That approach has allowed me to close a bit on Kimi in the classification and even if the gap to Vettel has grown a bit, we know that sooner or later, an opportunity will come to close up on him too. Today's outcome doesn't bother me in terms of the next round in Canada, because we have to consider Monaco a law unto itself, with a different set-up and unusual strategy as well as being a place where it is almost impossible to overtake. We know there is still much to do to improve, but we are looking ahead with confidence." Felipe Massa (DNF, Accident): "Today my race ended on lap twenty eight after an accident at the Ste. Devote corner, just as happened yesterday morning in the third free practice session. I was taken to hospital for all the precautionary checks and luckily everything is in order. I'm alright, I've just got a slight pain in my neck, but nothing serious. Now I will look to get in shape and be back 100% for the Montreal race. All I want to do is put this bad weekend behind me and think about doing well in the rest of the season." Stefano Domenicali, Team Principal: "We can't be happy with this weekend, not just because of the outcome of Fernando's race, but also because of the bad accidents that Felipe had. Fortunately, despite the violence of the impact, he is fine and has already gone home and I believe that in the space of a few days he will back in perfect shape and ready to race in Montreal. Apart from all the misfortune, it was a complicated race, conditioned by a few problems of a technical nature. Now it is important for us to understand why we were not as competitive as we were in previous races and try to react right away in Canada. Our aim is still to improve our qualifying and try to get back to the pace we had seen to date." Pat Fry: "First and foremost, I'm pleased that Felipe is okay. Today's accident looked very similar to what happened in the third free practice session, but in fact the two incidents are very different. Unlike yesterday, it seems that today's incident can be attributed to a problem on the left front corner of the car. It's too early to say precisely what happened and in the next few days, we will try and ascertain the exact cause back in Maranello. As for the race, I don't think it was the Monaco Grand Prix everyone was expecting where usually the drivers take to the track to race on the limit. Today it seemed more a race of containment, with a slow pace dictated by the leading group: it was reasonably clear that the fact the cars were grouped together had thus reduced the strategic choices for those behind. It was impossible to find a space to make a stop and not come out in traffic, especially because the pace of those running at the back was the same as that of those at the front. Furthermore, the various safety cars and the red flag meant the same reasoning applied in the second half of the race and therefore it was a procession for the whole race which would only permit a few risky overtaking opportunities." Jenson Button (6th): "Things weren't looking very good initially, but the Monaco Grand Prix is one of those races where you need to hang in there until the very end, because anything can happen “ and today it did. My opening laps were good “ I overtook Adrian [Sutil] and tried to have a go at Fernando [Alonso] at the hairpin. I tapped his rear wheel, so I wasn't really paying attention when Checo put a really good move on me out of the tunnel under braking for the Harbour Chicane. After the restart, Adrian also made a really good move on me into the hairpin “ I didn't actually think it would be possible because I'd tried it on Fernando earlier and it didn't work. Then, in the last few laps, Checo and Kimi [Raikkonen] tangled, and suddenly there was a battle behind them because they were circulating slowly in their damaged cars. So I took the opportunity to jump up the inside of Fernando at Rascasse, which was quite fun, and came home sixth. It was a pity that Checo's late-race retirement meant we couldn't score more heavily today “ that would have been a big boost for the team “ but I bagged a decent number of points, and our pace in clear air was good, so there are positives we can take away from today." Sergio Perez (16th): "I'd had a great race “ I'd been overtaking cars through the afternoon “ but in my opinion Kimi didn't leave me enough room when I tried to pass him as we exited the tunnel, and as a result I got squeezed into the wall on the entry to the Harbour Chicane. That was a real shame “ I'd overtaken both Jenson and Fernando there, and Jenson had overtaken me there too, but I couldn't have avoided the crash with Kimi. Of course, any passing manoeuvre at Monaco is risky, but, at the end of the day, you have to leave each other a little room. As a result of our contact, my car's brake ducts were affected and my front brakes overheated “ in fact I basically ran out of brakes. It's particularly frustrating to retire from a grand prix in which you've driven hard and fast, especially when you're so near to the finish. So, all in all, I'm extremely disappointed “ for the team as much as for myself." Martin Whitmarsh, Team Principal: "Jenson drove well all afternoon to finish sixth and thereby score a useful eight world championship points. Checo would also have claimed a decent haul of world championship points but for a coming-together with Kimi that compromised the efficacy of his brake ducts and eventually caused him to lose his braking. He's disappointed, understandably, but the up-side is that he was combative and entertaining on almost every lap “ and, more important still, he was very quick. McLaren has won the Monaco Grand Prix 15 times in the past “ considerably more often than any other marque “ so of course we're disappointed not to have been able to notch up win number 16 here today. But we were in the mix throughout, and it's clear that MP4-28's developmental trend is positive. Our next race will be the Canadian Grand Prix, which we've won 13 times in the past, which puts McLaren first-equal in the all-time Canadian Grand Prix win tally alongside Ferrari. We're not predicting Canadian Grand Prix win number 14 for McLaren in a fortnight's time, but undoubtedly we'll be giving it 100% between now and then in our efforts to make ourselves as competitive as we possibly can." Kimi Raikkonen (10th): "It was a really disappointing day. Because of one stupid move from Sergio [Perez] we've lost a lot of points to Sebastian [Vettel] in the Championship and you can't afford to lose ground like that. He hit me from behind and that's about all there is to it. If he thinks it's my fault that he came into the corner too fast then he obviously has no idea what he's talking about. It's not the first time he's hit someone in the race; he seems to expect people to be always looking at what he might do, then move over or go straight on if he comes into the corner too quick and isn't going to make it without running into someone. Not the ideal weekend but there's nothing we can do about it. At least we got one point back at the end." Romain Grosjean (DNF, Suspension damage): "Daniel [Ricciardo] seemed to be really struggling with his rear tyres and they looked to have a lot of graining. I'd been following him for almost all of the 61 laps but I was caught out by him braking early in the middle of the circuit and there was nowhere for me to go. It's a frustrating end to the weekend, but the real damage was done in qualifying when I didn't get through to Q3. That was Daniel again who I was held up by, but it certainly wasn't my intention to end my race in the back of his car! Now we just press the reset button and head to Canada hopeful of a better weekend all round." Eric Boullier, Team Principal: "This is certainly not the weekend we wanted. Kimi was impeccable all weekend once more and his race was ruined by another driver making unnecessary contact with his car. This caused a puncture and basically ruined his race. Romain had a difficult weekend, but showed fantastic pace when he had a clear track in front of him. We've lost ground in both the Constructors' and Drivers' Championships this weekend so we'll be pushing twice as hard when we get to Canada to make amends. On a more positive note, we were extremely proud to have Daft Punk “ making only their third public appearance in twenty years “ join the team for the race, and would like to express our gratitude to Columbia Records for helping make this concept a reality. The team has a truly unique brand image, and we're keen to continue this unorthodox approach moving forwards." Alan Permane, Chief Race Engineer: "A very frustrating race for us. Both of our cars were bottled up in traffic almost all of today, which is what you can expect in Monaco if you're not leading. Romain was unfortunate to get caught out by the car in front, but he has received a ten-place penalty for Canada which will compound today's woes. Kimi was running strongly in fifth position, but his race was completely compromised by the late pit stop we were forced to make. That he was able to make back three places in the last two laps shows just how hungry he is. We head to Canada wanted to return to business as usual." Riccardo Penteado, Engine Support Leader: "One point from that sort of race is ultimately disappointing, particularly as Kimi was in such a good position for 90% of the Grand Prix. From the engine side of things it has however been a good weekend. Both cars were using units for the third race to give us flexibility later in the season when the standings will be tight. Aside from the engine on Kimi's car running a bit hot under safety car conditions there were no issues, which gives us a stable platform for the coming races." Nico Rosberg (1st): "Monaco is such a special place to win and it just feels amazing today. It was my childhood dream to win this race and to do it in a Silver Arrow on the streets where I have lived all of my life is fantastic. I can't quite believe it has happened yet and it will probably take a while to sink in. Thank you to the team for the car that we had this weekend and it's good to have been able to show the same level of performance on Sunday and convert our pole position. The whole weekend went pretty much to plan, even though qualifying was tough with the weather conditions. I didn't have the best start today which meant Lewis and Seb got pretty close but after the first corner, I was able to set my own pace. Then it was just a case of keeping a cool head through all the incidents and the team did a great job of keeping me in touch with what was happening. Thank you to everyone here today and back at the factories in Brackley and Brixworth. I hope this win today is the first of many more to come for us." Lewis Hamilton (4th): "It's been a great weekend for the team and I'm really happy for everyone. Big congratulations to Nico, he's been awesome all weekend here and really deserves that victory. From my side, this weekend hasn't really been the best and we didn't make the most of the opportunity for a one-two finish today. When the safety car came out, I needed to maintain a gap so we didn't get delayed with the double pit stop but unfortunately the gap was too big and we lost out to the two Red Bulls. That's motor racing and these things happen sometimes. It's the tightest track in the world here and virtually impossible to overtake unless you are much quicker than the car in front so there was nothing I could do to improve my position. But it's great for the team to have achieved our first victory of the season and I hope we can carry through the performance we showed here to Montreal." Ross Brawn, Team Principal: "Congratulations to Nico today. He did not put a foot wrong all weekend, topping every session and driving a very poised and controlled race. He richly deserves this second win of his career. Lewis was running very comfortably in second position until the Safety Car period just before both drivers had made their first stops. The team did a fantastic job all weekend in a challenging qualifying session and a difficult race. But we are all aware, Monaco is not a completely representative circuit. We will take the time this evening to enjoy our success but know that we need to keep pushing to understand how to extract the maximum from our car at every circuit and keep improving further." Toto Wolff, Mercedes Motorsport Director: "Nico was dominant not just this afternoon but all weekend. He did everything right from the first lap on Thursday and he really earned this victory. Lewis lost some time in the second sector on his in-lap behind the Safety Car and that cost him position to the Red Bulls, so we need to find out what happened there. As for the team, congratulations to everybody in Brackley and Brixworth. The guys at the track overcame all the obstacles that were put in their way this weekend and the team at the factory have achieved a great step in performance with the car. Now we need to keep pushing so we can repeat this taste of success at different types of circuit through the rest of the season." Nico Hulkenberg (11th): "We couldn't expect any miracles today, and yesterday we weren't in the top ten either. Today we just lacked speed throughout the race. Unlike most of the other drivers, I started on soft tyres at the re-start, which was ok in the beginning. But, after another Safety Car, the tyres never came back to life again. The rears especially degraded a lot. When I got out of the car I could see the steel belt, so it's no wonder the pace wasn't good enough anymore. It's a shame, as that point would have been ours." Esteban Gutierrez (13th): "It was very challenging to bring the car back home without any scratches or a crash. The first Safety Car compromised our strategy and in the end we just had to make the best out of that situation. We couldn't expect to score points, but I did my best to use every opportunity I had to gain positions. Nevertheless, it was also important to not go over the limit and finish the race. I had a good re-start and was able to fight, but one of the points where we have to improve is the top speed in order to be able to fight for positions. It was tough with Williams in front and Lotus behind. On the other hand, I need to work so I can cope better with changing conditions in qualifying." Monisha Kaltenborn, Team Principal: "We are disappointed with the result today, because we were in a position to score points. The first safety car period compromised our strategy. But the most surprising thing for us was that we couldn't gain an advantage with our choice of tyres for the re-start. Although Nico was on soft tyres - the harder compound - the degradation was higher than that of our competitors, who were on super softs. Both drivers drove well, but the car simply wasn't good enough on this track. We still believe, however, the measures we took will show an improvement again in the next race." Tom McCullough, Head of Track Engineering: "It was a typical eventful Monaco race with several Safety Car periods and a red flag. Both drivers drove well today, but ultimately the car was quite hard on its tyres. The degradation was too high, and the overall pace was not quick enough to score points. So we need to regroup and prepare for Montreal in two week's time." 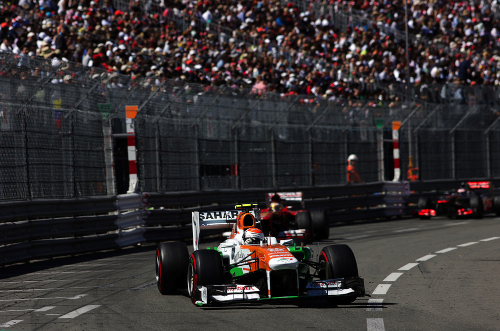 Adrian Sutil (5th): "Fifth place feels fantastic. It's just the result we needed and I'm very happy right now. The car felt very good and we made the most of the chances that came our way. It was difficult to move forward in the first half of the race when I was stuck in the train of cars, but the red flag opened up some more opportunities. It meant that everybody was on the same sprint strategy until the end of the race. I noticed that the hairpin was an area where there was a chance to overtake so I tried it with Jenson and it worked. Then I did the same with Fernando and it worked once again. So I think I showed that overtaking is possible in Monaco. The team did an excellent job all weekend and we definitely deserved this result today." Paul di Resta (9th): "Given where we started we went with an aggressive strategy and it probably would have paid off without the safety cars. The pace was strong, but I was stuck behind lots of traffic in the early part of the race. I managed to pass a few cars going into turn one, but towards the end of the race the cars were more bunched up and it was not so easy. I was stuck behind Vergne after the restart and I had one good chance to overtake, but he defended very well. Fortunately with the cars ahead battling and making contact I made up some positions and scored a couple of points. So after the disappointment of yesterday, the boys did a great job and it's good to continue my run of finishes in the points." Dr. Vijay Mallya, Team Principal: "A very eventful Monaco Grand Prix and I am delighted to see both Sahara Force Indias come home safely in the points. With Adrian's fifth place and ninth place for Paul, we have added 12 points to our tally and strengthened our hold on fifth position in the championship. Adrian's drive was superb as he showed great speed and patience all afternoon. He waited for the right opportunities and made the most of them. I think everybody enjoyed his two overtaking moves at the hairpin on two former world champions. It's our best result in Monaco and very well deserved by the entire team. Paul was also superb, showing his overtaking skills into turn one, and recovering from P17 on the grid to score two points. I congratulate the whole team on another strong weekend and hope that we can deliver more of the same in Canada in a couple of weeks' time." Valtteri Bottas (12th): "It was difficult to overtake in the race today and even though sometimes we felt like we had the pace, we couldn't make the moves we wanted. There was a lot of action in an eventful race so I was happy to bring the car home. We need to keep pushing because Montreal will be a track that is easier to overtake, so we need to ensure we have the speed to attack and defend." Pastor Maldonado (DNF, Accident): "It was an unfortunate incident today with the Marussia car and the impact was quite big. Fortunately I am ok and the stewards took immediate action. We need to move on from a disappointing weekend but I'm looking forward to the next race in Canada, where we will be continuing to demonstrate the improvements in the car." Mike Coughlan, Technical Director: "We planned to do a one-stop strategy with both cars today but Pastor had contact on the first lap so had to make an unscheduled stop for a new front wing. Pastor drove well, managing his tyres after the first safety car period, but then had a big accident which caused a red flag after a Marussia collided with him on lap 45. Pastor was unharmed but disappointed that his race ended early. Valtteri drove a mature race doing a great job in his first Monaco Grand Prix. The red flag allowed those cars around us to change onto new sets of tyres, so strategy didn't come into play as much in the end as it could have. We were chasing a point in the final stages but it didn't quite come to us." Laurent Debout, Renault: "Our most competitive race performance so far this season. Valtteri drove a very mature race to look after his tyres and was close to the points. It was a shame for Pastor but we are all pleased he is OK. Montreal is another type of circuit entirely but one that should again suit the RS27 engine so we hope we can finish even better there." Jean-Eric Vergne (8th): "In some ways, it was rather a boring race, as I never had a clear track ahead of me! All the same, it's always exciting to race at Monaco, especially when you score points. In the closing stages, Sutil did a good job in front of me passing Jenson and Fernando at the hairpin, but I was coming up behind and couldn't get past as of course they blocked me. It was a good race of course, finishing eighth and picking up four more points. After some unfortunate races earlier this season, I said good luck and bad luck come round in equal measure and today everything went well for us. On top of that, it was clear that our car was very strong today and in fact I set my best lap really early on with a lot of fuel, as the rest of the time I was in the middle of the pack which was frustrating, as my car was faster than those ahead of me. I'm pleased to be eighth, but I am looking forward to doing better in the coming races." Daniel Ricciardo (DNF, Accident): "My start off the line was fine and I decided to go for the inside as I saw the usual brake locking up ahead and thought that would be the best place to go. But there was a bit of a road block and Bottas was able to go round the outside of me which cost me a position. In the first stint, I struggled on the Prime tyre and after the stop, I was better on the Option, but from then on I was stuck in the pack. As for the crash, I could see that Grosjean had got a good run out of the tunnel and that he was close, so I defended my line and the next thing I knew he was over the back of me. I haven't seen it on a TV yet, but at the moment I believe it was a misjudgement on his part and a costly one that was quite dangerous, even if we are both okay. This race can be frustrating, as I was in a train, but I didn't have the pace to move forward. Now we need to move on and try and make a step forward for Canada." Franz Tost, Team Principal: "In many ways this was a typical Monaco Grand Prix with plenty of excitement, but not much overtaking. For Jean-Eric to start from tenth on the grid, after getting into Q3 yesterday for the first time in his F1 career and then cross the finish line in eighth place is an excellent result. It proves that our car performance is improving and that the team is doing a good job, but Monaco is the one track on the calendar that is more about the driver, so congratulations to Jev for keeping out of trouble and maintaining his concentration on this very long afternoon. Having started on the Option, his tyres were holding up well and the team on the pit wall did an excellent job to call him in for his pit stop immediately after Massa's accident, even before the Safety Car was deployed. However, the red flag meant that everyone was able to fit fresh tyres, so this cancelled out the advantage we had hoped to have over those who were in trouble with their tyres. Then, towards the end, the Raikkonen-Perez incident eventually gave us a well deserved eighth place. Starting from twelfth, Daniel dropped a position at the start and stayed in 13th place throughout until lap 62, when he was hit from behind by Grosjean, coming out of the tunnel and he had to retire. When he had some clean air, he was lapping strongly, but the Safety Cars and red flags did not work in his favour." Giedo van der Garde (15th): "That was a pretty crazy race! I made a good start from 15th but then Maldonado hit me, damaging the floor and meaning I had to come straight in for a new nose on lap one. I rejoined in 22nd and at that point, even though I had good pace and was catching the pack up again, it looked like my race was over, especially after losing KERS on lap 10. We were able to reset KERS and then Monaco did what it always does, and when the safety car came out for Massa's crash I was able to unlap myself and get back into the action. In the car it felt like I couldn't have any less luck, but then on lap 45 I was with Chilton, Bianchi and Maldonado when they had their incident. I didn't really see what happened between them, but obviously the red flag gave me a chance to start again, this time from 18th. From the restart, on soft tyres and with 28 laps to go, I was holding position in 17th after Chilton's drive-through and then the second safety car came out and I moved up to 14th when a couple of cars ahead pitted. I was right behind Bottas, in front of Gutierrez, but unfortunately after 13 laps the tyres were destroyed. I had Chilton right behind me and with the tyres in the state they were I couldn't hold him off so I finished 15th. After the way the race started, just to be there at the end was pretty good, but it's obviously not how we wanted it to go after such a good Saturday. However, it's another race done, more lessons learned and, overall, a pretty good weekend." Charles Pic (DNF, Gearbox): "It's obviously disappointing for my race to end that early, especially as I'd made a really good start and was running in 15th ahead of Gutierrez and just behind Di Resta on the same pace as him when I had to stop. It looks like the cause of the retirement was a gearbox problem and the fire was from the exhausts which had overheated. It looked a lot more dramatic than it felt in the car “ I could feel there was a problem and started pulling over and as soon as the car stopped there was a lot of smoke, but it was all out quickly and the marshals did a good job to clear it away without bringing out the safety car. As I say, it's a shame as we'd had a good weekend until that point. The car felt great in the race and as our deg levels were good on the long runs we were looking at stopping only once which could have put us right in the middle of the action. However, we're in Canada next, at another circuit where I think we'll be able to show how the car's pace keeps improving, and with a bit more luck we'll be in a position to have a better weekend." Max Chilton (14th): "Overall I'm pleased with a positive conclusion to the race after what has been a difficult weekend for us. I fought hard in the latter stages to ensure we had something good to take away from Monaco and naturally I am very happy that I was able to get past Van Der Garde on the penultimate lap for 14th. With regard to the accident with Pastor, Esteban made a late lunge into the chicane and I could see he was locked up so I had to take action to avoid him, which meant missing the chicane. I rejoined coming out of Turn 11 and the apex to Turn 12 was fast approaching. I was aware that someone was behind me but not alongside me. The stewards determined a drive-through penalty for me and I accept that decision. After the race I went to see Pastor to check he was okay. The incident made for a difficult rest of the race but all I could do was concentrate on the best result for the Team and, problems aside, I think we have to be pleased with the end result." Jules Bianchi (DNF, Accident): "After a tough weekend here in Monaco I was hopeful that we might have the opportunity to turn things around in the race, but it was not to be, unfortunately. On the grid at the start I had an electrical problem and couldn't select gear, so I had to start from the pit lane. It was a bit worrying but at least I could start. For that early part of the race I was right with Max but I had to think about looking after the tyres and hope that the race would come to me. After Maldonado hit the barrier in the accident with Max, the barrier came back out at me and my nose was damaged, so I had just pitted when the Red Flag came out. I was lucky that the damage was only limited to the nose and I could continue with the race. After that I was just looking to bring the car home, but I had a failure of the right front brake disc and that took me out at Ste Devote. It's a big shame but we have learned a lot I'm sure from some of the problems we had this weekend." John Booth, Team Principal: "Today's race was incredibly eventful for the whole field and our Team was no exception. We are sorry for the problem which Jules experienced on the grid but things started to look up for us from there. Our strategy was working well and we had a to make a few late calls, including the late one to pit Max under the second Safety Car period so that he could take on a fresh set of option tyres and have a shot at Van Der Garde. Thanks to an incredible drive from Max in the closing laps, he got by on the second to last lap and ensured we had something positive to take home, because, by then, Jules was unfortunately out of the race. It was a nice reward for Max after a good recovery following the incident with Maldonado. It seems that Jules suffered a failure of the right front brake disc and for that again we must apologise to him. There is a lot to learn from and improve on after this weekend but in the main we are still happy with the result."